Villars is a traditional Swiss ski resort in the French-speaking canton of Vaud and is a decent choice for beginners and intermediate level skiers. The village sits on a ledge with great views to the Rhone valley and even Mont Blanc beyond and is nicely accessible from Geneva. Villars is a dual-season resort that is also popular in the summertime, with the surrounding area having a great sunshine record. The resort's fantastic climate, great location and scenery have made it a popular place for the rich and famous, with a number of notable figures having chalets there. It's also home to two of the world's most expensive boarding schools, so doubt be surprised if you're sharing the slopes with the mega-wealthy as they visit their kids during the winter ! Villars - The Good, the Bad, ...and the Facts! One of Europe's most family-friendly resorts. A list of webcams for Villars and the surrounding area. Villars and the surrounding area has a great sunshine record, one of the best in Switzerland, which is nice. Yet whilst this is great news for summertime visitors and is fine in the skiing season if the weather is cold enough and plenty of snow has fallen, historically Villar's sunny climate has sometimes caused some issues in the early and late parts of the ski season. A combination of this sunny location, the relatively low altitude pistes (only just topping 2000m) and southerly-facing aspect of the slopes at Bretaye and Les Chaux has resulted in some issues of soft snow and dramatically melting snow cover. Villars does tend to get plenty of snow though - it's westerly location tends to mean that it catches weather fronts coming in from the west as they hit the Alps. The Glacier 3000 ski area up above nearby Les Diablerets provides the surrounding resorts with some snow-sure guarantees in the ski brochures, but in reality these slopes are rather limited and are quite a trek away for those skiers staying in Villars. Like we said, these considerations apply more to early and late season, and mid-winter conditions are often still fine. Both the resorts of Villars and Gryon have announced plans to drastically improve the snow-making, so this will undoubtedly help things. Villars is undoubtedly a family friendly resort with a nice mix of clientele, pretty tame après-ski (certainly no rowdy element to it) and a generally relaxed and friendly vibe to the whole place. The skiing will suit families too, with a nursery slope near to the station, and nice easy runs up at Bretaye to progress onto, and some easy intermediate slopes as well if they've already progressed beyond the beginner level. The only thing that would make it even better for young kids was if the main street in Villars was pedestrianised. Any Summer Skiing at Villars ? You may see suggestions that resorts such as Villars and Gryon have a summer skiing option up at the glacier above Les Diablerets. However, whilst that used to be the case years ago, the reduction in the Les Diablerets glacier has meant that whilst skiing is still available both early (November) and late in the season (May), it's no longer available throughout the main summer months. Villars (official name Villars-sur-Ollon) first became a real focal point for skiing back in 1913, when the train link was built from the village up to Bretaye, which allowed a much easier means of access to the hills above Villars. By the mid 1930's Villars had it's first ski lift built up at Chaux Ronde, and the resort had soon become established as one of the best in Europe. Whilst the outbreak of the 2nd World War stopped the development of skiing at Villars (like all ski resorts) in it's tracks, it continued to progress through the 1950s and beyond, whilst still retaining the resort's traditional look and feel. Like some of the other neighbouring resorts, Villars is well known for it's boarding schools, with allegedly two of the worlds most expensive schools located here - Aiglon College (3rd most expensive school in the world) and College Alpin International Beau Soleil (the most expensive school in the world !). As ski resorts go, Villars is in a pretty fine location, with the nearest major airport being Geneva. If your transfer is not included in your holiday then definitely consider the train. Villars is just over 2 hours away by train from Geneva with a change required at Bex for the final 40 minutes climb from Bex up to Villars on the scenic funicular. The entire train journey is beautiful - it sweeps initially around Lake Geneva, through Lausanne and Montreux until it starts to wind up into the hills. A relaxing, and stunning, start to your holiday. Information on the Swiss ski area Alpes Vaudoises, including links to the surrounding resorts, webcams, slope information and lift details. A list of piste-maps for Villars and the surrounding ski areas. Villars - Any Chance of Early Snow ? 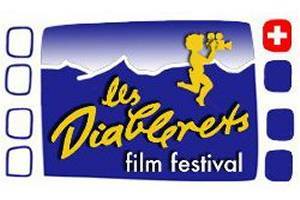 The 2016 Les Diablerets Film Festival will be the 47th running of one of Europe's largest events dedicated to films centred around the mountains. Centre piece of the festival is a giant screen showcasing the latest action from some of the world's top outdoor film directors, including some free-riding features. There also climbing walls and exhibition stands to visit. 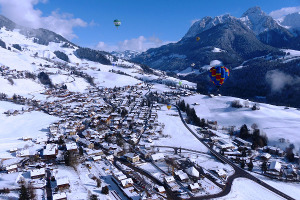 When it comes to ballooning, the Swiss resort of Chateau-d'Oex is the Alpine capital, and this is the festival to celebrate it. The 2016 festival will be the 38th in the history of this renowned international event, and will feature about 100 balloons, including 10 special shaped ones, from over 20 different countries. The highlight for us though has to be the fantastically named event - "the David Niven Long Distance Hare and Hounds Competition" ! As the festival normally runs in the last week of January it's possible to combine a visit with a skiing holiday in the area - Chateau-d'Oex is situated in the Pays-d'Enhaut region (between Lausanne and Interlaken) and there are a number of other ski resorts close by, including Gstaad for the millionaires amongst you. The Chalet Royalp is a chic hotel situated in Villars-sur-Ollon, in the heart of the Swiss Alps. The Chalet Royalp has fantastic views of the surrounding mountains and a number of features to keep all the family happy - indoor and outdoor playgrounds, billiards and games room, cinema, boutique and library. The Chalet Royalp also has a choice of 3 different restaurants and a spa. Located in Ollon, a small village in the heart of the Alps, Odette and Francois offer two charming and comfortable guest-rooms in their villa. From the terraces of the house, the garden, or from the window of your room, you can enjoy a splendid view of the Alpine peaks (3257m Dents du Midi, Dents de Morcles 2968m). In summertime you can appreciate a large and wonderful flower garden, decorated with sculptures of Odette, and also a beautiful pool. It is an ideal starting points for sport (skiing in Villars or Portes du Soleil, hiking or golf) or to discover the region (Lake Geneva, Vaud Riviera, Lavaux is share of the UNESCO World Heritage, Martigny and it's Gianadda Foundation).